Functional artistry from Yamazaki. This 5 piece "Gone Fishin" museum collection is made from stainless steel and claims to be designed with "perfect weight and balance." They also make a salad serving set and pastry server in the same style. 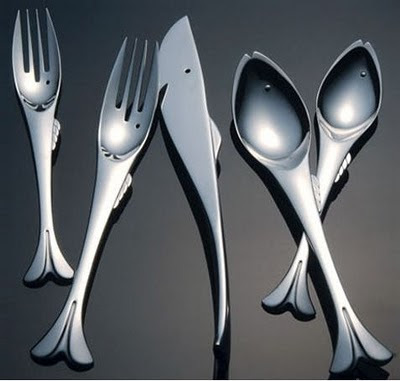 This fish inspired flatware has angling wedding present written all over it. I've looked at these before. Love them.